Australian centre Blair is moving from NRL club Melbourne Storm, having signed a three-and-a-half year deal, and is a big name replacement for Jake Webster, who left the club at the end of last season. 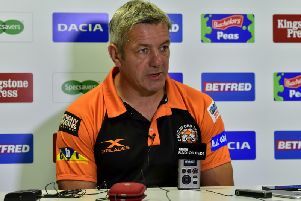 The Tigers have been keeping tabs on the player for some time and after the deal was announced last Friday evening Cas chief Wells described it as a “huge statement of intent”. He said: “The process has been going about two months. “It was quite obvious after the start of the season that there was an issue there with the right edge. 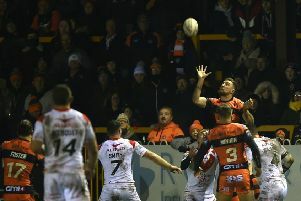 “Daryl and the coaching staff had looked to give a couple of guys their head and state their claims for a place in reshaping that right edge after Jake Webster left. “But about eight weeks ago we initiated negotiations with a couple of clubs on a couple of players and Cheyse very quickly became the favourite. The more we looked the more we liked about him. “The negotiation proper started about a month ago and it was a massive decision for Cheyse and his family – he’s never been out of Australia playing sport. “What’s been great for us is that we have been able to land a high quality player, somebody who is going to add an extra dimension. “The guy’s massive and he will play outside Mike McMeeken, that’s a formidable difference to the squad. "We look forward to seeing what he can do and what he brings to the team when he comes." Wells backed up his initial comment that Blair's signing was a statement of intent going forward for the Tigers. He added: "He's such a high calibre player. I think it's potentially the biggest signing for five or six years. "I can't wait to see him play because I think he'll be a star for us."